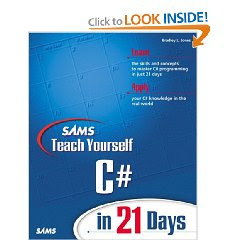 Description: This book will take you, step by step, through learning C#, the computer industry's newest and most productive language. This complete guide covers topics from basic program construction to intermediate level application engineering. Following "21 days" formula, this book is a three week intensive course for the beginning programmer who wishes to get started with this exiting new coding standard. The comprehensive lesson plan will enable the reader to understand, design and build applications that are compatible with the new Microsoft .net framework.